Science has pursued its fascination with the Mona Lisa once again, this time by applying X-ray techniques to understand the shadowing in her face. The painting was one of seven Leonardo Da Vinci masterpieces investigated by Philippe Walter and colleagues. Their investigation describes the ultra-thin layers of glaze and pigment used to achieve seamless transitions from light to dark. The work is reported in the journal Angewandte Chemie. It is said to provide new information on the technique known as "sfumato", which Da Vinci and other Renaissance painters used to produce delicate gradations in tones or colours across the canvas. "One of the most striking things you will notice in front of one of these paintings is that you can't see any brushstrokes, any fingerprints," observed co-researcher Dr Laurence de Viguerie. "Everything is so fine, everything is blended. That's why it was said these paintings were impossible to analyse because they don't give you any easy clues," she told BBC News. Previous research has already established key aspects of sfumato, but Philippe Walter's group has provided additional insights on how Da Vinci achieved this effect. The team used X-ray fluorescence (XRF) spectrometry to determine the composition and thickness of each painted layer. Crucially, XRF is a non-destructive technique - it does not require samples to be lifted off the canvas. Nine faces (including Mona Lisa's) were assessed from seven paintings produced by Da Vinci covering a 40-year period in his career. The scientists were able to detail the different recipes used by the master to make the shadows in the faces. These recipes were characterised by a technique - the use of glaze layers or a very thin paint - and by the nature of the pigments or additives, they said. It is clear from the analysis that Da Vinci was able to apply glazes in layers just a couple micrometres (thousandths of a millimetre) thick, building up to a total thickness of no more than 30 to 40 micrometres. 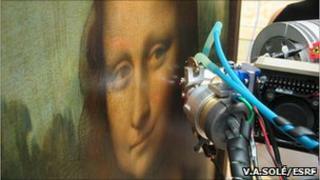 The study was conducted in the rooms of the Louvre Museum in Paris where the Mona Lisa is kept. The other paintings included in the research were Virgin of the Rocks, Saint John the Baptist, Annunciation, Bacchus, Belle Ferronnière, Saint Anne, the Virgin, and the Child. The Bacchus is thought to be the work of Da Vinci's studio, and so may not have been produced solely by the great master. Philippe Walterand Laurence de Viguerie are affiliated to the Laboratoire du Centre de Recherche et de Restauration des Musees de France.